The other thing that makes life hard for collectors are limited figures. For example Touhou merchandise has to be limited in some way or another and very few international shops carry those (usually for a little more than the retail price in Japan but that’s nothing compared to the trouble of using a proxy). Limited figures are very common and subject of rage for even the most dedicated (non-Japanese) collectors. Limited usually means: limited to certain Japanese online shops that will only ship to Japan, magazine mail-order exclusives (which are even more elusive), limited quantities (usually also limited to Japanese only) or one time convention only releases (only sold at a certain convention, rare for PVC figures but common for garage kits). Using a proxy means to let the shop send the items to a person in Japan and this person will then ship the items to you. I haven’t used one so far and it’s also possible to use a proxy for Yahoo Auctions! (eBay is not popular with the Japanese). See Rinkya, ShoppingMallJapan or Tenso. You won’t be able to avoid to plan ahead either. Preorder figures is easier than polling the shop site at the release date and it happens a lot that supply is sold before it’s released (preorder closed) speaking you won’t have the chance to buy it when it is released. I’d avoid shops that need you to pay beforehand if possible. If you tend to get yourself in the red for ordering too much, you might me interested whether your shop of choice allows order cancellations but you shouldn’t do that often either case. You are sure to get the item when you preorder. Backordered items are cumulated orders your shop will send out sometime later (you have to wait just as if you’re preordering) to ask the manufacturer if they’re available. So you’re not guranteed to get it. Shipping fee is a heartbreaking topic. The item is already pricey enough and you will have to pay half the price for getting it shipped to your doorstep. But most shops will leave the choice to you how to ship them. SAL (Surface Air Lifted) (500 yen or more) is the economy version, there’s no tracking (outside Japan) and your parcel has to be lighter than 2kg. It’s a lot cheaper than EMS and it is my shipping method of choice but some collectors have made bad experiences with parcels getting lost and so on. SAL takes about a month to Germany, usually a little less but not less than two weeks. I don’t mind waiting but if it’s really important to you, use EMS (Express Mail Service) and pay more (like 1500 yen or more). If your country doesn’t hate you and confines your package in customs (depending on how nice they are, it can take ages) it should arrive in less than a week. The package is being tracked and is being covered for should it get lost. People say your package is sure to get in customs when using EMS but I don’t really know. So far almost *every* of my orders were held in customs but that depends on your country. Look for how much you’re supposed to pay to customs as well. If it’s a lot, it may be better to buy from local shops (or online shops of your own country). Consider joining Tsuki-Board.net (aka MyFigureCollection). It’s a nice community and their monitoring feature is worth a lot when you’ve missed the first wave of preorders. They have active users that’ll comment as soon as figures are available again somewhere. 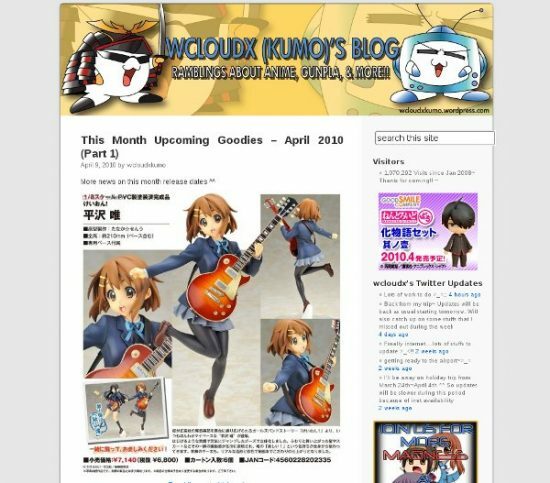 Wcloudx (kumo)’s blog posts release dates and provides summaries of upcoming figures. Most figures also get a “XYZ Reservation Starts! !” post to make sure you won’t be missing them. Figures Plus is a very useful site also. I find the Spanish (it’s a bilingual blog) a bit confusing but the blog presents releases in a very clean way, including also links to shops so you don’t even have to search for yourself. Otacute: The shop I buy most frequently from. AmiAmi: They went international not so long ago. It’s a huge shop so they get offer good prices to customers too. HobbySearch: Good prices, usually on par with AmiAmi (well, a little more). They sometimes have nice stuff for sale and only recently started offering SAL shipping. e2046: Sells mostly garage kits but has quite a few PVC figures too. YesAsia: Only bought from them once. If you happen to have experiences from other shops, please inform me so I can add them. Not really looking for something specific? Anime figure sales is like a goldmine when you’re hunting sales. Recent figures are usually put up for sale in shops for clearance after some time and here’s the info who’s selling what. The website hasn’t been active at all times but you’re only looking for bargains anyway, aren’t you?